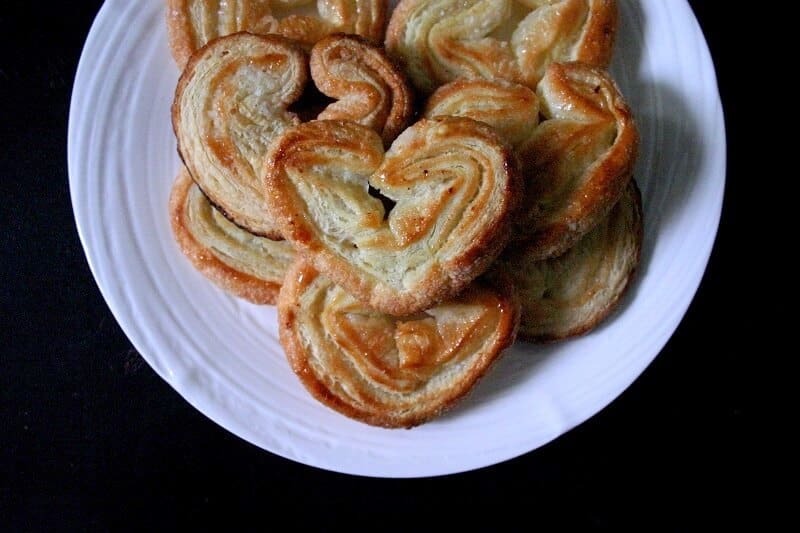 if you want to make something that makes people go BS, THERE’S NO WAY YOU MADE THOSE, then palmiers, aka french butterfly cookies aka elephant ears, are perfect. you need 2 ingredients and 20 minutes, then you’re set to wow everyone. it’s the kind of thing that calls for guidelines rather than a whole recipe, and i’ll leave you with ina (we’re on a first name basis, didn’t you know? )’s palmier advice. the only thing i’d change i’d make to her recipe is cut down on the sugar when you roll out the puff pastry. you’re probably not going to get 2 cups of sugar to stick, and you end up wasting a ton of sugar. just sprinkle sugar on as necessary, and when the dough’s surface seems to be saturated with sugar crystals, stop adding it. easy peasy. if you notice that they’re getting a little soft and not as crispy (bring back what once was mine), toast them in a toaster oven. don’t walk away, since they burn very easily! now, palmiers are delicious alone, but they’re also good with ice cream (duh). 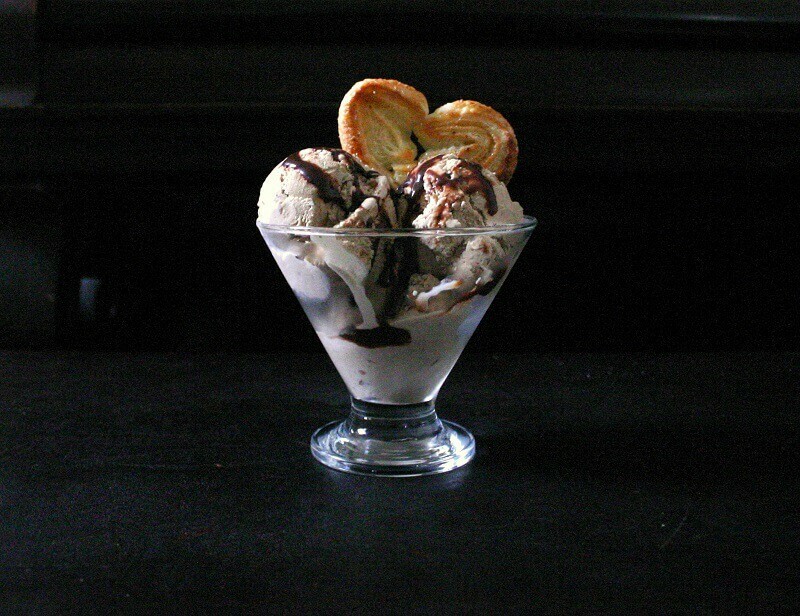 below is a very easy sundae with toasted almond ice cream and hot fudge sauce from fenton’s (highly recommend if you’re in the bay area), topped with a cookie (though i’m sure no one would complain if there were multiple palmiers on top). the palmiers are so neutral that they’d pair well with any sundae: vanilla ice cream and salted caramel, a banana split (unless you claim that adding a palmier would be sacrilege), lychee coconut sorbet with raspberry sauce. i could go on, but i’ll leave you now, and hope that you are suitably convinced of the merit of making and devouring a batch of palmiers. LOVELOVELOVE palmiers! Yours are soooo pretty! Ina and I are on a first-name basis too :). Since I’ve baked and cooked my way through all of her books I feel like she and I are besties, haha. Love the idea of using these as garnish on a sundae. i haven’t cooked through her books enough! whenever i flip through them, i always end up bookmarking 75% of the recipes, lol. Ooh, yum! I’m always interested in recipes that are impressive but easy! Count me in! I also love Ina, she’s a goddess in my book! and now i have the image of ina in a toga and and a gold crown and a scepter in my head 😂 but yes, definitely a goddness (though maybe not a greek one). Ina is awesome! Such great recipes and always entertaining! If a few of these landed on a sundae, I’d certainly be a happy girl! Plus, they look so pretty 🙂 !! THESE look sensational! SENSATIONAL I tell you!!! Holy yummmmm!!! You can never go wrong with Ina. Her and I are on a first name basis too… although I’m not sure she’s aware of our arrangement. Lol! LOVE palmiers! They are so fancy looking, yet easy enough to make. Yours look just PERFECT, girl! I’ll take a dozen, please! <3 Cheers! sigh, same, i think my relationship with ina is a bit unrequited. thanks! they’re pretty easy (dare i say almost foolproof?!) to make them look amazing. Oh wow, i always thought these were very hard to make. Love them and always buy them but now I will be trying them at home. These look great! We used to make them at our coffee shop! People loved them especially because we made them super sized. They were literally the size of my head! oh wow, i don’t blame the customers; i’d be down for a super sized palmier any day! I love the look of these – will definitely have to try!! Yes Yes and Yes! 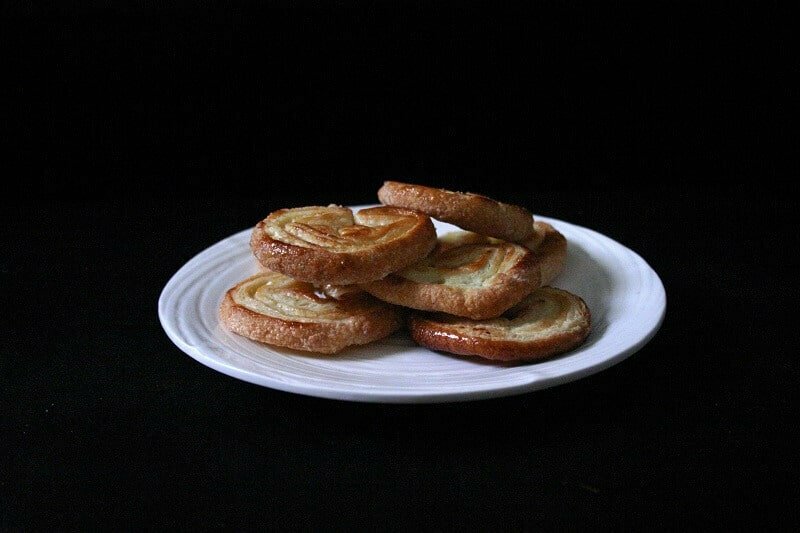 I’ve had Palmiers, and there’s absolutely no way I could have successful bake these crispy bites of goodness. 2 ingredients and 20 minutes? You must be messing with me, Heather. Ok Ok, I’m going to try them myself. I’m excited and a little nervous. they might look super loose and not at all right, but smoosh them back together, shove them in the oven, and then they transform (perhaps another reason why they’re called butterfly cookies?). Love Love LOVE palmiers and the fact that you can get fancy schmancy in two steps. Ha! What a bargain! i love bargains! 😉 even though i did spend 3ish hours prepping and rolling sushi this morning, so maybe i don’t always find the best time/effort to enjoyment bargains lol. Me and Ina are besties. Ha ha, I wish. I love palmiers (so delicious and easy to make!) and the shape that you made them are very cute! Great idea to eat them with ice cream too! so according to the comments, there’s a handful of people (including you and me) who are best friends with ina. the only problem is that she keeps ignoring us! time to start a petition? So delicious and finger-licking! I have to give them a try! 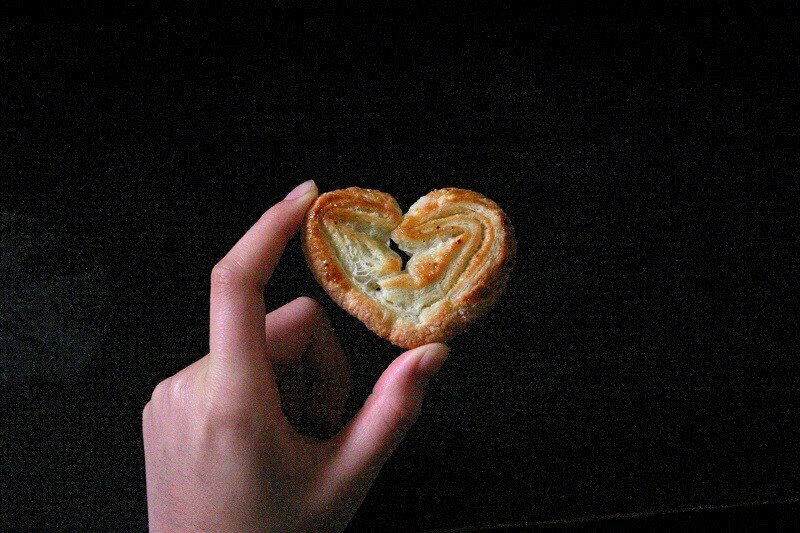 finger-licking is definitely allowed (especially if there’s flaky pastry bits and sugar crystals!). I’ve watched Ina make palmiers countless times. It’s so mesmerizing to see her working in the kitchen!! Totally agree with you on all that sugar getting wasted part and I’m glad you’ve made it more catered for home cooks. You already know I love my share of sugar, Heather, but I adore how you’re so conscious of healthier eating for yourself and folks like me! I think it’s so cool that there’s really only two ingredients and that it will wow people because my mouth dropped when I saw it was that sinchy to make!!! Oh and adding it to ice cream, girl you’re reading my mind!!! my suggestion to get rid of the excess sugar was more out of a waste not mindset than for health reasons, but go ahead and keep thinking that i’m looking out for everyone’s sugar consumption! 😉 that’s a nice side benefit.